Farmers markets play an important role in increasing the availability and accessibility of local foods. They offer more places for local farmers and producers to sell their products, and invite the local community to gather over a variety of delicious, fresh foods in their own neighborhoods. We operate farmers markets primarily in areas with limited access to fresh food — connecting eaters with a reliable source for nutritious, locally sourced options. Markets shown here are operated seasonally by Farm Fresh RI. 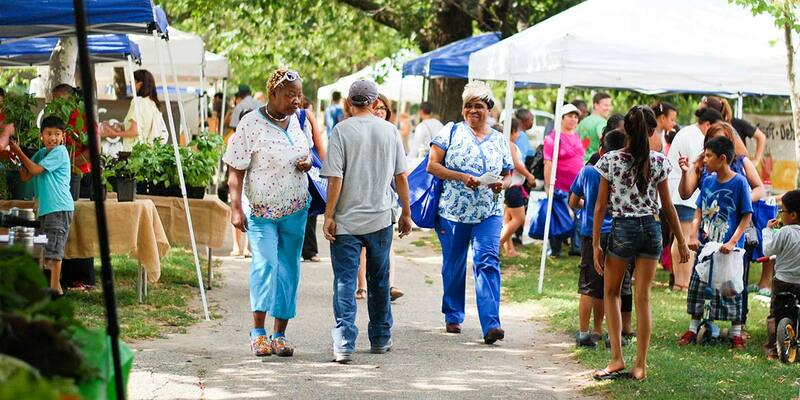 We are also happy to connect you with the 40+ farmers markets operated each year across Rhode Island. Find the farmers markets nearest you. Double your SNAP at the farmers market! Our Bonus Bucks nutrition incentives program gives a 100% bonus to shoppers using federal SNAP (Supplemental Nutrition Assistance Program) benefits at all Farm Fresh RI farmers markets and a large number of other markets across RI. That means for every dollar you spend with EBT, you get a FREE dollar in Bonus Bucks to spend on fresh fruits and vegetables at the farmers market! A look at our vibrant community marketplaces, where we support a diversity of locally grown foods and work to make them accessible to all Rhode Islanders.